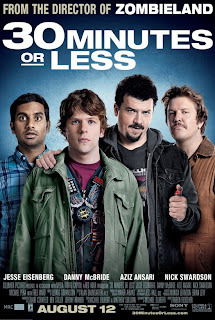 Ruben Fleischer's 30 Minutes Or Less follows pizza-boy (Jesse Eisenberg) forced into robbing a bank as part of an elaborate scheme from a low-life criminal (Danny McBride) to get $100,000 to hire a murderer to kill his strict, military man father (Fred Ward). 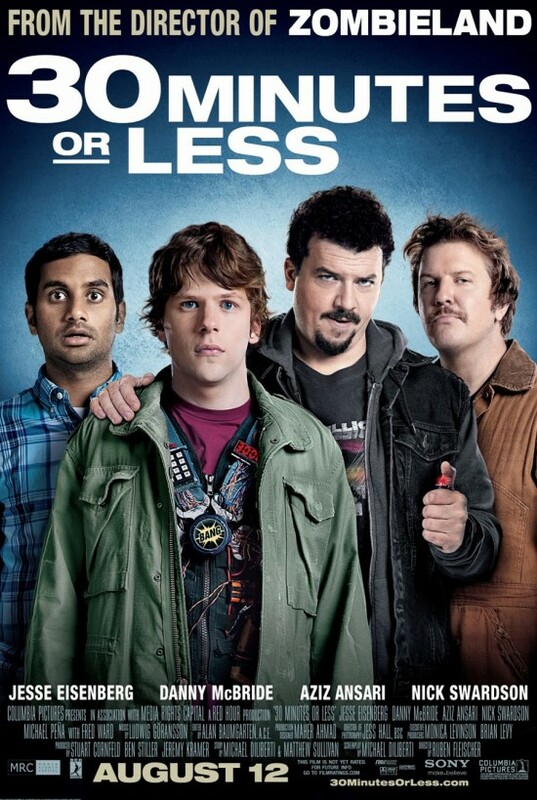 Aziz Ansari and Nick Swardson also star in this so-so homage to the the buddy action comedy genre. The film's narrative feels slightly disjointed, with a mix-match of various scenes at times in a slightly incoherent order. 30 Minutes Or Less does not flow, suffering from a frantic and mechanical script with dialogue and jokes that feel slightly second rate. A fair amount of the gags fall completely flat (mostly those from McBride and Swardson's characters), although there is the occasional moment of genuine humour. Fortunately, the film does have a talented cast which keeps the film entertaining and saves the poor script. Jesse Eisenberg brings his typical nervous energy and excitement to the role, although it's frankly the exact same role most viewers will be accustomed to seeing him play (the same can be said for Ansari and McBride). Although McBride's character feels poorly written - there is something very funny about seeing him playing his typical overconfident and half-witted 'man-child' role. However, this film is really a vehicle for Parks and Recreation's hilarious Aziz Ansari, he has the rare skill of being able to make almost anything funny. And for that reason alone I'm glad I've seen 30 Minutes Or Less. Flesicher's film does have it's moments, it's hard not to get a little buzz in the film's car chase scene when Glen Frey's The Heat is On kicks in (very Beverly Hills Cop). Or when McBride and Swardson's characters are thrusting at Jason Voorhees whilst watch Friday the 13th 3-D.
30 Minutes Or Less is fairly entertaining 83 minutes with a standout performance from Aziz Ansari, although a clunky script and some flat gags hinder it from surpassing 'being quite good'.